What a cracking dog Rover is. He was brought into Foal Farm Animal Rescue in Biggin Hill, Kent as the owner was unable to cope with his change of behaviour of not wanting to be in the house after a change of circumstances in the home. Rover has since been assessed in a home and he definitely wants to be in the house. He actually loves his home comforts that cannot be provided in rescue, so finding a new home for him is getting to be very urgent. 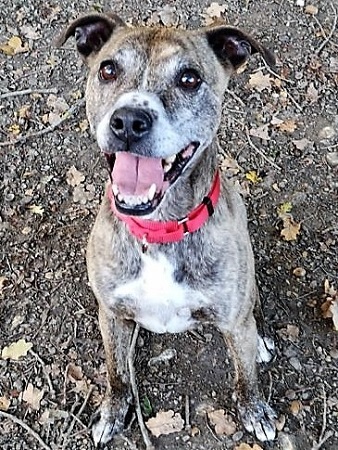 Rover is a Staffordshire Bull Terrier Cross and is 9 years old. He is a beautiful, gentle dog who adores people and has lived within a family home happily and without incident. He’s such a lovely and affectionate boy who has lived in a sensible foster home with a young child and 2 other dogs. Rover does suffer with some separation anxiety when left but is quick to learn when a routine is established. He was previously good when left so it’s known he can cope with some ongoing training. As a companion you couldn’t ask for a better dog and, with a little time and patience, he would make an ideal dog. Rover has been neutered and is in good health with no known medical issues. Please mention that you saw Rover on the Oldies Club website.